Brush both sides of fillets with a small amount of oil then gently rub with spice mix. Set aside. Cook couscous according to packet instructions. Or, in a medium saucepan bring to boil 2 ½ cups of vegetable stock and 1 tablespoon of oil. Reduce heat, add couscous, stir and simmer until liquid is absorbed. Cover, remove from heat and let stand for 5 minutes. Before serving, gently fluff couscous with a fork to separate the grains. Mix through parsley, capsicum, lemon rind and toasted almonds. Meanwhile blanch or steam broccoli in boiling water. Drain well. To cook the fish. Heat a non-stick frypan over medium heat (or use a conventioal frypan and lightly oil). When the pan is hot add 2 fillets and cook for a few minutes each side. Wipe out the pan with paper towel and repeat with the remaining 2 fillets. 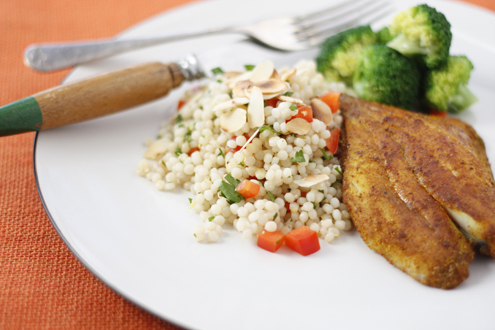 Serve fish immediately on a bed of couscous, with a side of brocoli and a wedge of lemon.